In the past they have been dull and predictable affairs but Scottish football finally delivered a January transfer deadline day worth shouting about. No, the cash wasn't splashed in the multi-millions (even the most optimistic or deluded fan would now concede that those days have long gone) but deals were done and money changed hands. For Scottish football, that is progress. 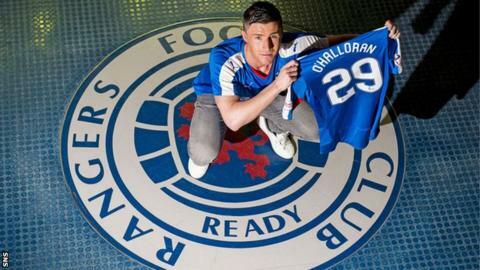 After testing the water with initial offers a few weeks back, Rangers took the plunge and spent in the region of £500,000 to take forward Michael O'Halloran from St Johnstone. Having already missed out on Brentford midfielder Toumani Diagouraga earlier in the month, eyebrows would have been raised if the Ibrox club had failed to get this one over the line. The bruising left and lessons learned by past financial mismanagement, as well as their position at the top of the Scottish Championship, meant that the club were always unlikely to spend big. A signal of intent it was not - fans will be hoping that comes in the summer. The tea and biscuits in the Celtic Park media room were laid out twice in the space of a few hours as the Premiership champions paraded their January purchases. Reporters were left counting the crumbs on the floor as the Manchester City youngster Patrick Roberts told the tale of being bought a Celtic strip as a young boy. The 18-year-old winger, who has signed an 18-month loan deal, said all the right things and exuded all the confidence and composure of a man well aware of his recent £12m price tag. If he is to be the new fans' favourite, the new media favourite may well be his new team-mate and second signing of the day, Colin Kazim-Richards. The heavily tattooed Turkey international striker bounded into the press room like a man who couldn't quite believe his luck. Ten clubs in 10 years suggests something of a footballing nomad but he says he's determined to settle down. The prize for best business of the day may well go to Hearts. Striker Osman Sow was out of contract in the summer but he's heading to China in a deal worth about £1.5m. And so with money burning the pockets, head coach Robbie Nielson secured the services of long-term target John Souttar from Dundee United. The hole left by Sow was filled by Nigerian forward Abiola Dauda, who arrived on loan from Vittesse Arnhem, while former Scotland midfielder Don Cowie moved to Tynecastle as a free agent. Aberdeen tussled with Inverness Caledonian Thistle over Greg Tansey but despite a bid and a move looking likely at one stage, it came to nothing. Dons manager Derek McInness had said previously he was unlikely to add to his squad but, as David Goodwillie headed out on loan to Ross County, Welsh striker Simon Church arrived on loan from MK Dons. As the day wore on, the phone kept flashing and the deals kept coming - even managerless Kilmarnock were at it. In years gone by the Rugby Park club were usually among the first to let you know that no business was expected. This year, Gary Dicker and Lee Hodson were the men keeping chairman Jim Mann up past his bed time. Motherwell and Partick Thistle weren't to be left out - they concluded deals of their own. Mark McGhee took Morgaro Gomis from Hearts until the end of the season and over in Maryhill, Thistle were signing an Englishman called German - Antonio German that is. In a frantic 24 hours a total of 15 players were brought in by Scottish Premiership clubs - in the English Premier League the tally was eight. The sums involved tear strips off the statistic but it's a small sign that in Scotland there may be some life in deadline day after all.